The production, storage and transport of food are subject to strict guidelines and standards. 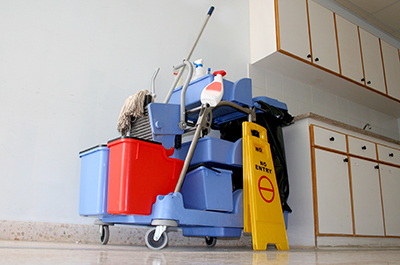 Among other things, companies need reliable cleaning concepts in order to be able to comply with these specifications. The optimum synergy between cleaning methods, machines and agents, together with the appropriate accessories, is essential for this. 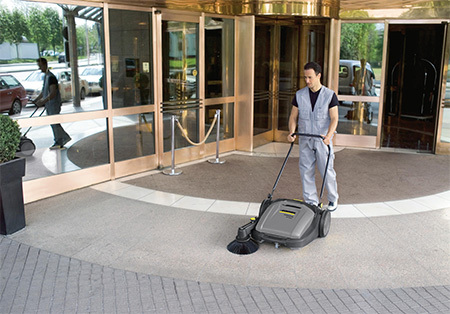 Among the machines and methods used are wet and dry vacuum cleaners, industrial vacuums, scrubber driers and sweepers, extraction systems, steam and ultrahigh- pressure technology, and dry ice cleaning. In addition to complying with hygiene and occupational safety standards, success factors include efficiency and seamless integration into the production process – a journey through a challenging world. Germ reduction is the main requirement when handling raw meat. 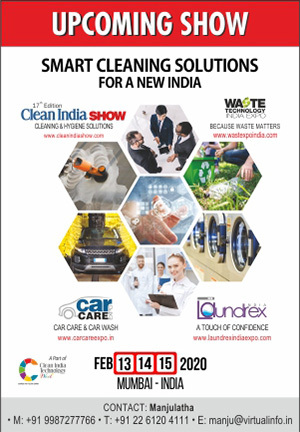 Therefore technologies, machines and cleaning agents are needed which effectively combat germs and bacteria. The final clean of the day is carried out in the “three-step method”: preliminary cleaning of the complete production systems involves the use of handhot water with degreaser in order to remove meat residues mechanically with brushes and scrapers. 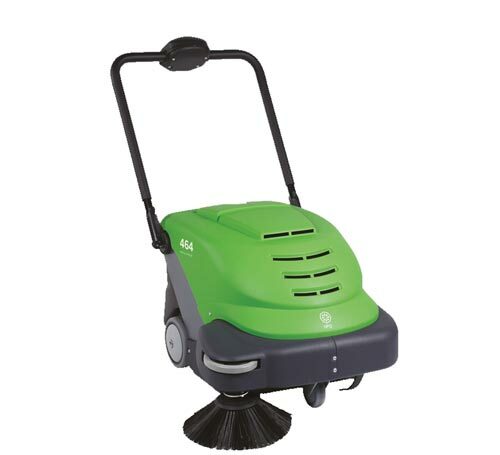 This is followed by deep cleaning using special hygiene high-pressure cleaners, whereby hot water at a temperature of up to 85°C is mixed with the appropriate cleaning agent to form a foam. This is applied to the surfaces being cleaned with a foam lance. It is important that the cleaning agents used are capable of removing blood, protein and grease. Following the prescribed contact time, which is dependent on the type of cleaning agent, dosage and level of dirt, surfaces are rinsed with hot water. The final step is disinfection. In order to be able to carry out this time-consuming cleaning process efficiently, many chicken abattoirs prefer to use stationary, permanently plumbed in HACCP-compliant highpressure units with multiple points of use. They offer the possibility of multiple high-pressure lances being in use at the same time and allow cleaning to be carried out very quickly. Moreover, the amount of space taken up by equipment is reduced and there is no risk of mobile machines spreading germs. 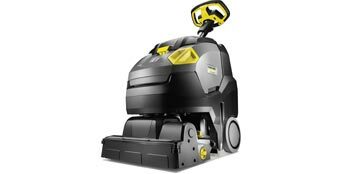 In hard-to-reach places, such as the crevices between tiles, steam cleaners ensure the highest level of cleanliness. The hot steam efficiently removes stubborn dirt such as grease, oil and limescale which provide a breeding ground for germs and bacteria. Steam cleaners with an automatic self-cleaning function prevent the formation of germs inside the machine once cleaning is complete. Cleanliness is also a top priority in warehouses. 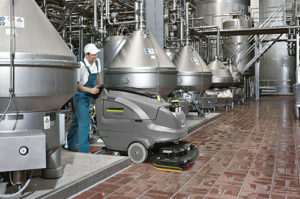 Scrubber driers or sweepers are the machines of choice here. The goods vehicles are cleaned from the outside in washing facilities on-site, while the interior cleaning is carried out by stationary highpressure units. While day-to-day production processes in abattoirs tend to be wet, bakeries are literally as dry as dust. The main challenge is the fine flour dust, which spreads everywhere, deposits itself on the components of the machines, and as a result reduces the lifetime of the machines. Not least, it presents an explosion hazard. In order to avoid this, the first step is to install stationary ATEX-compliant extraction systems (explosive atmospheres). According to the ATEX Product Directive 2014/34/ EU, these may be used in areas where there is a risk of explosion, and they are capable of absorbing the flour dust immediately during dough production. The next step is to use mobile vacuum cleaners with heat-resistant hoses up to 200°C for intermediate cleaning of the ovens. In the food industry, there are numerous norms and standards. The main ones include the quality management system HACCP (Hazard Analysis and Critical Control Points), the food, product and service standards IFS (International Featured Standards) and the international standard for food safety, ISO 22000. The regulations set out in the ECD documentation (European Cleaning Document), issued by the DVTI (German Association for Tank Interior Cleaning) and the associated European umbrella organisation EFTCO (European Federation of Tank Cleaning Organisations), apply to mobile tanks, containers and silos. During deep cleaning, removing dirt particles, such as dried-on dough residues from conveyors and production machines often involves working with dry ice, a particle blasting procedure in which CO2 pellets are used as a spray agent. The pellets are ejected in a compressed airstream up to the speed of sound and sublimate immediately upon contact with the surface being treated. The action of dry ice blasting is based on three physical effects: firstly, the ejected pellets release their kinetic energy upon impact. Secondly, the matter being removed becomes brittle as a result of the sudden cooling to minus79°C and cracks. Thirdly, some of the frozen carbon dioxide penetrates into the cracks of the encrusted dirt, sublimates, thereby increasing its volume by a factor of 700, and causes the dirt to split off completely. The advantage of this cleaning process is that it is fast, thorough, dry and gentle. Sensitive components of the production systems, such as motors or valves, are not damaged. Water is used again in the final clean of the day of the production systems, whereby either, as with chicken abattoirs, stationary highpressure units with multiple points of use are installed, or individual mobile machines are used. Likewise, in bakeries where, for example, sandwiches are prepared in kitchens, wet cleaning is carried out with high-pressure cleaners and scrubber driers. From flour silos in bakeries to milk tanks in dairies or goods vehicles belonging to logistics companies: the EFTCO standard (SQAS) has been mandatory for cleaning mobile tanks, containers and silos in the food industry since mid-2015. Underlying this are the increasing safety and quality requirements which make providing evidence of a continuous cleaning chain, from production to storage to transport, essential. In order to be able to ensure the best possible cleaning result, the optimum synergy for the respective task between mechanical action, temperature, cleaning agent and time is crucial. Fundamental to this is knowledge of the relevant container type (tank, silo, ISO container, tank wagon or IBC container) and the products being put into them. Since hot water or even steam must frequently be used, solutions which heat the fresh water much more efficiently using heat recovered from the waste water, thereby reducing costs, can be beneficial.